← Search for the Perfect Knit Top: Attempt 1. Have huge ugly T-shirt – can remake! Alabama Chanin designs caught my eye recently. The neon pink 3XL T-shirt had more than enough fabric for her princess seamed tank top. Princess seaming is one of the rules guidelines for the Perfect Knit Top. So is muffin top camouflage width below the waist. Alabama Chanin’s tank top included both. Her books include embellishment stencils and ideas. So Attempt 2 was sewn. The fit is wonderful. Love the wider hem – it does its camouflage job perfectly. The straps are a bit too narrow to hide “undergarment” straps – but even so, the top is perfect for working out in. The embellishments are on the back of the tank. 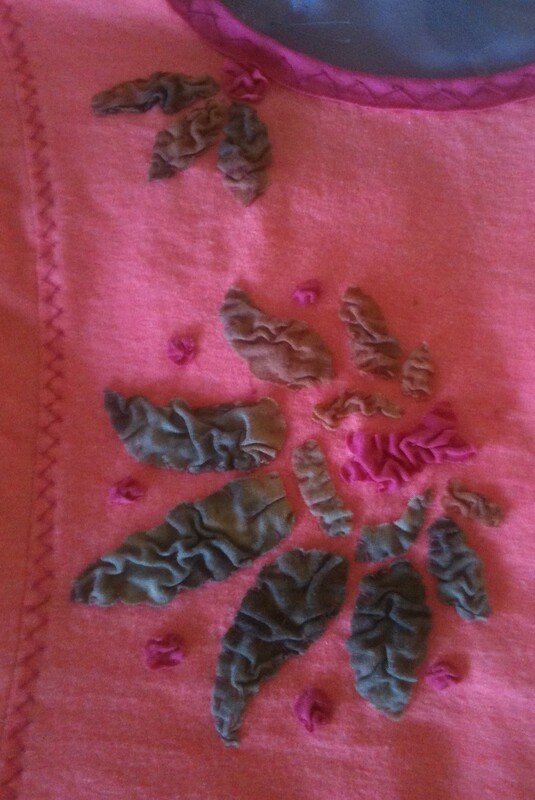 The heathered knit used for the flower petals is from The Stash. 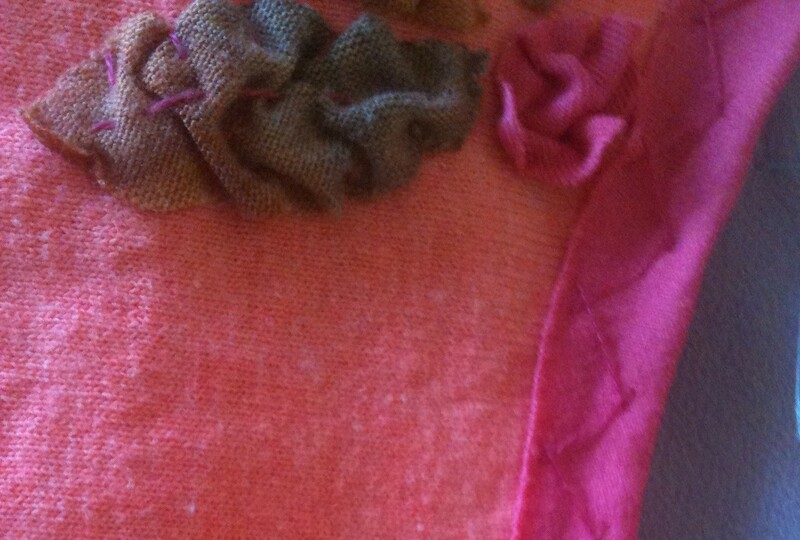 The raspberry accents and neckline edging were cut from an old workout top. Children’s washable markers were used to transfer the design to the fabrics. They worked well – and washed out completely! As the top must stretch, the hand stitching must stretch as well. The Alabama Chanin books provide excellent instruction on how to stitch with stretch! Is this the Perfect Knit Top? No. It is a nice workout top. Can’t wait for another ugly T-shirt so I can revise the pattern and try again! This entry was posted in Clothing, Embellishment, Sewing, Stash Couture, T-shirt remake and tagged Alabama Chanin, Alabama Chanin Tank Top, Tank top from t-shirt. Bookmark the permalink.